I've recently returned from a month in South Africa and I was looking to unwind while the jetlagged kids sleep. 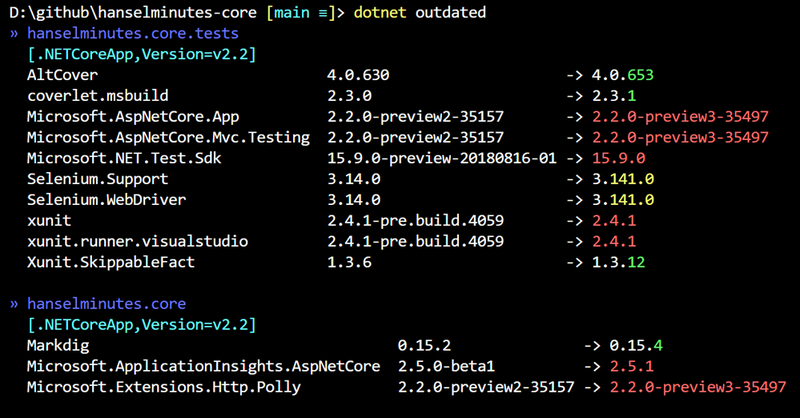 I noticed that .NET Core 2.2 Preview 3 came out while I wasn't paying attention. My podcast site runs on .NET Core 2.2 Preview 2 so I thought it'd be interesting to update the site. That means I'd need to install the new SDK, update the project references, ensure it builds in Azure DevOps's CI/CD Pipeline, AND deploys and runs in Azure. Let's see how it goes. I'm a little out of it but I'm writing this blog post AS I DO THE WORK so you'll see my train of thought with no editing. Ok, what version of .NET Core does this machine have? Tool 'dotnet-outdated' was successfully updated from version '2.0.0' to version '2.1.0'. Looks like I'm on Preview 2 as I guessed. I'll take a moment and upgrade one Global Tool I love - dotnet-outdated - in case it's been updated since I've been out. Looks like it has a minor update. Dotnet Outdated is a great utility for checking references and you should absolutely be using it or another tool like NuKeeper or Dependabot. I'll head over to https://www.microsoft.com/net/download/dotnet-core/2.2 and get .NET Core 2.2 Preview 3. I'm building on Windows but I may want to update my Linux (WSL) install and Docker images later. Let's try to build my podcast website. Note that it consists of two projects, the main website on ASP.NET Core, and Unit Tests with XUnit and Selenium. Restore completed in 80.05 ms for D:\github\hanselminutes-core\hanselminutes.core.tests\hanselminutes.core.tests.csproj. 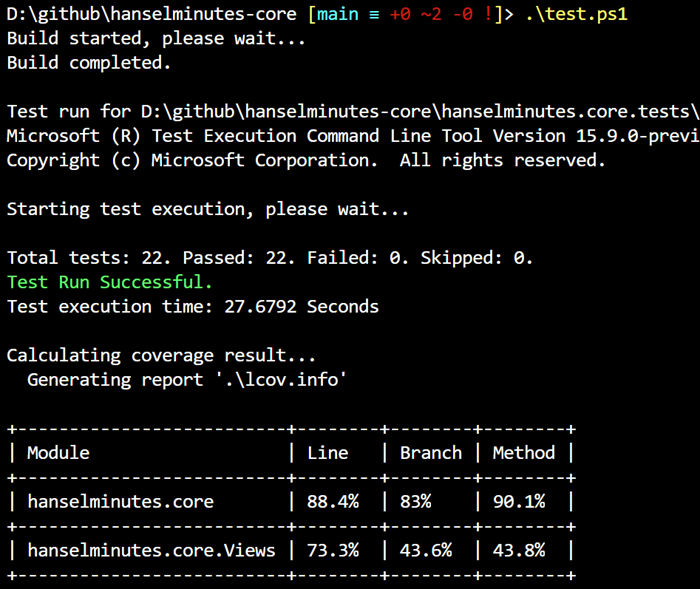 Restore completed in 25.4 ms for D:\github\hanselminutes-core\hanselminutes.core\hanselminutes-core.csproj. The dotnet build fails, which make sense, because it's saying hey, you're asking for 2.2 Preview 2 but I've got Preview 3 all ready for you! Let's see what "dotnet outdated" says about this! Cool! I love these dependency tools and the community around them. You can see that it's noticed the Preview 2 -> Preview 3 opportunity, as well as a few other smaller minor or patch version bumps. I can run dotnet outdated -u to automatically update the references, but I'll want to treat the "reference" of "Microsoft.AspNetCore.App" a little differently and use implicit versioning. You don't want to include a specific version - as I did - for this package. Doing this also fixes the build because it picks up the latest 2.2 SDK automatically! Now I'll run my Unit Tests (with code coverage) and see how it works. Cool all tests pass (including Selenium). It builds locally, will it build in Azure DevOps when I check it in to GitHub? I added a .NET Core SDK installer step when I set up my Azure Dev Ops Pipeline. This is where I'm explicitly installing a Preview version of the .NET Core SDK. While I'm in here I noticed the Azure DevOps pipeline was using NuGet 4.4.1. I run "nuget update -self" on my local machine and got 4.7.1, so I updated that version as well to make the CI/CD pipeline reflect my own machine. D:\github\hanselminutes-core [main ≡ +0 ~2 -0 ! ]> git add . D:\github\hanselminutes-core [main ≡ +0 ~2 -0 ~]> git commit -m "bump to 2.2 Preview 3"
Cool. While that's building, I'll make sure my existing Azure App Service (website) installation is ready to receive the deployment (assuming the build succeeds). Since I'm using an ASP.NET Core Preview build I'll want to make sure I have the Preview Site Extension installed, per the docs. If I visit the Site Extensions menu item in the Azure Portal I can see I've got .NET Core 2.2 Preview 2, but there's an update available, as expected. I'll click this extension and then click Update. 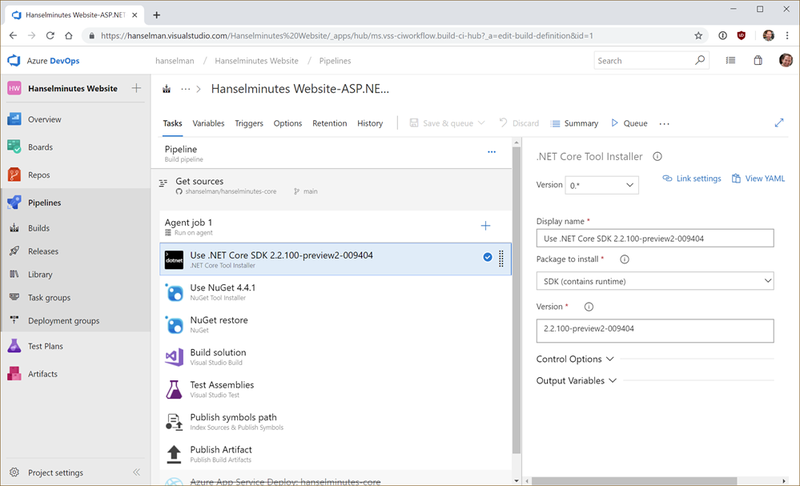 This extension's job is to make sure the App Service gets Preview versions of the .NET Core SDK. Only released (GA - general availability) SDKs are installed by default. OK, .NET Core 2.2 is all updated in Azure, so I'll confirm that it's deployed as well in Azure DevOps. Yes, I'm deploying into Production without a net. Seriously, though, if there is an issue I'll just rollback. If I was deeply serious about downtime I'd be doing all this in Staging. 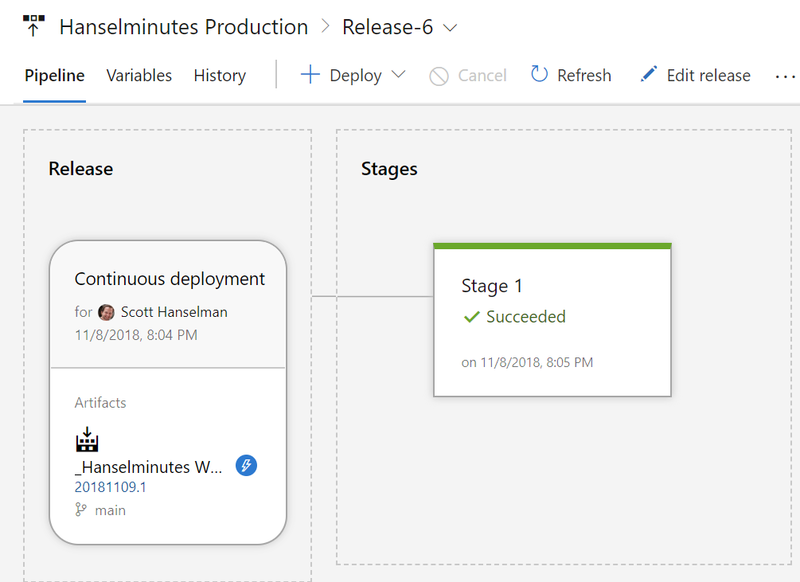 Successful local test, successful CI/SD build and test, successful deployment, and the site is back up now running on ASP.NET Core 2.2 Preview 3. It took about 45 min to do the work while simultaneously taking these screenshots and writing this blog post during the slow parts. After using Azure for more than five years I had no idea that the Preview Site Extension existed, thanks for that info 😁 Also the outdated tool looks neat, have to give that a try as well! Nice to see the thought process play out, Scott. Another good read, as always. Have you thought about making a docker build environment that could run locally as well as in your CI system? Seems like the next step for build consistency and ease of maintenance. Perhaps they'll switch to Core 3.0 in the New Year but it seems ISP upgrades are a bit less than alternate these days.